This is part 2 of a 3-series story about Problem Solving on the Road. Here you can find part 1. 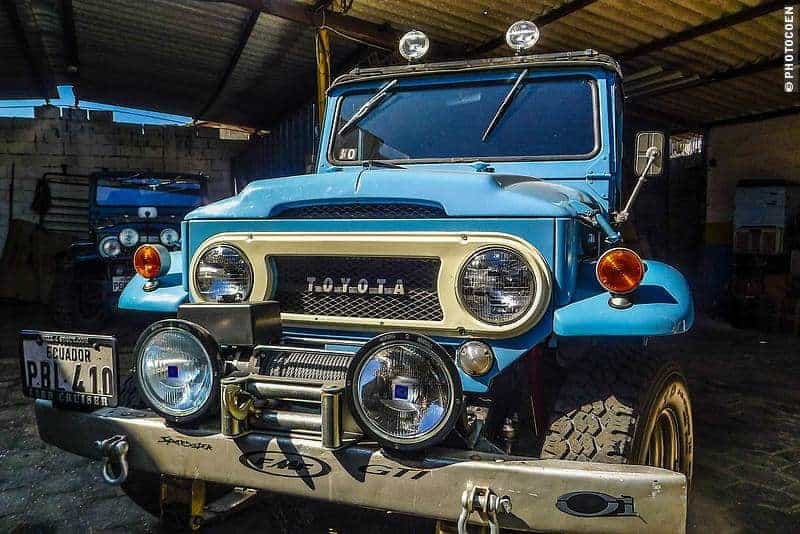 So I was lying under the Land Cruiser when I spotted it, as I told you in my previous post about Pedro Villota’s workshop in Quito [read about it here]. Pedro came over to have a look and told me this, a crack in the frame, was probably the cause of all our problems: the crooked hood, the horn with its own soul, the goose-bump-sound that the steering shaft had been making, and, moreover, the odd clacking sound when cornering uphill plus the tugs in the steering. The good news was that we didn’t have to disassemble the complete front. The bad news was that the Land Cruiser had yet another crack in the frame. This in itself was easy enough to fix, but it doesn’t give much hope for the future; we may be shopping for a good secondhand frame in the coming year. I cleared the gearbox from nuts, bolts, covers, levers and wires. It just hung in rubber mounts on the bridge. When we commenced operation “drop the box”, I counted five of us, two hydraulic jacks, a crowbar and a piece of rope. 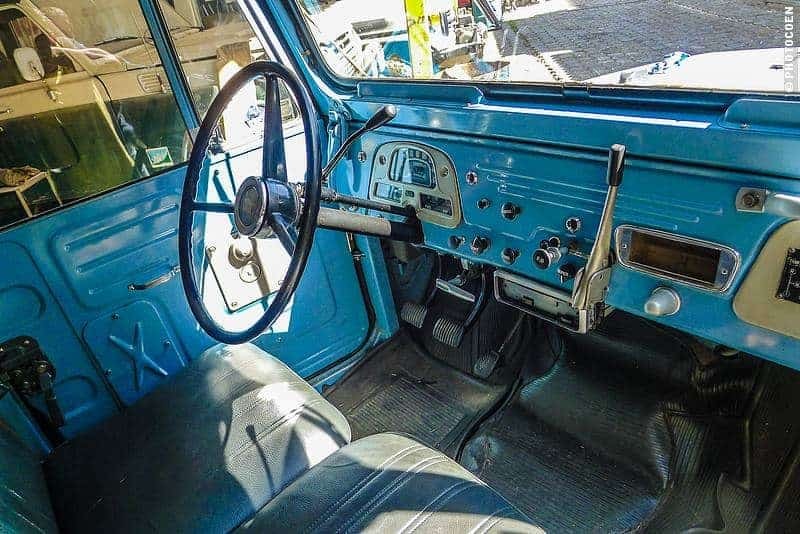 I was sitting inside the Land Cruiser holding the rope from the top through the hole where the three levers normally stick out. 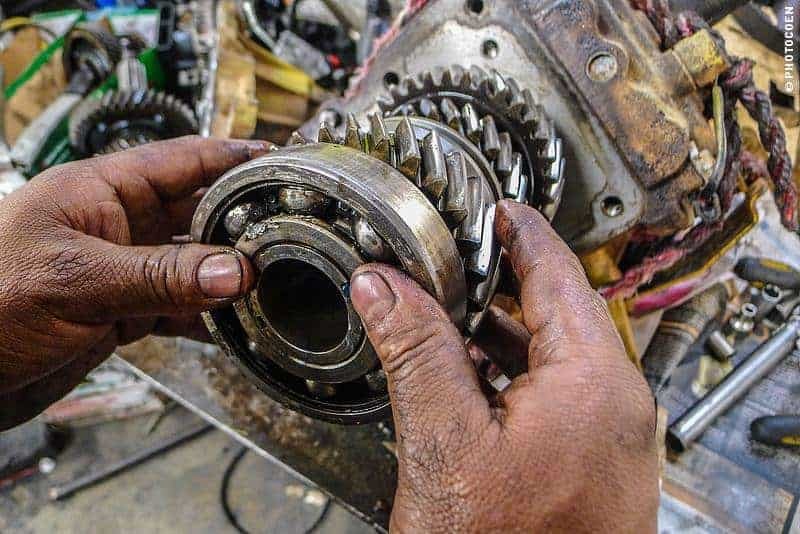 I heard the guys arguing, cursing and cajoling in order to collectively lower the gearbox on the floor. 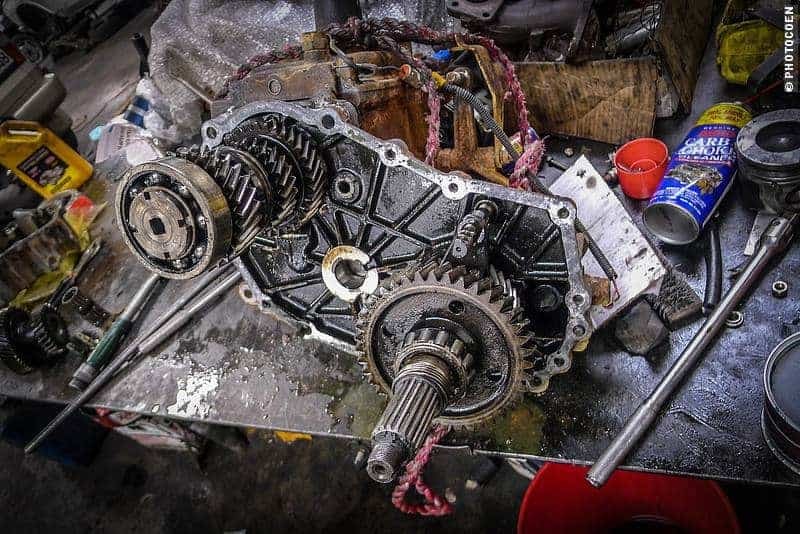 I took the gearbox with a crane to the car wash station, which is part of the workshop, where a degreaser and a high-pressure gun worked miracles. Although years of Asian and Amazonian mud flew off the aluminum sides, the more stubborn red clay stayed put in the nooks of the reinforcement walls. I needed a toothbrush to clean most of it, but still, some of it simply didn’t budge. 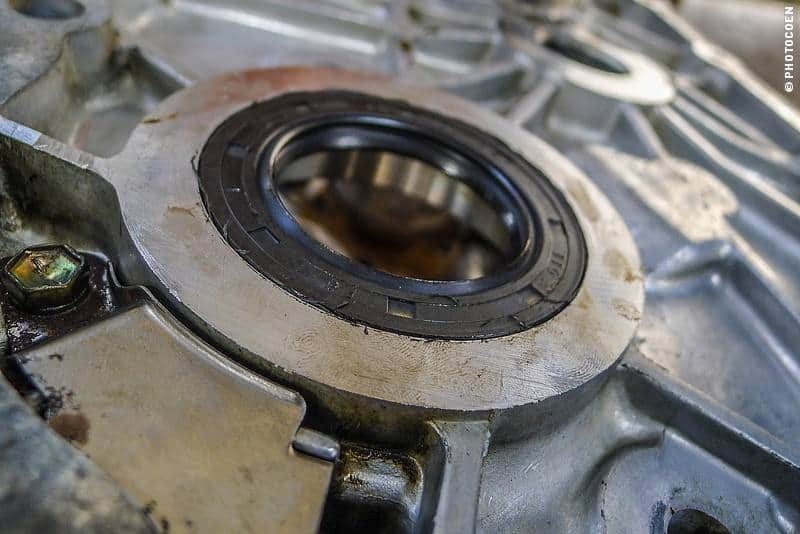 We left the gearbox for what it was and concentrated on the seal between the gearbox and the transfer case. It was hard and dried out, without any flexibility left in it whatsoever, so that was a no-brainer: it would have to be replaced, together with a few other gizmos we encountered. 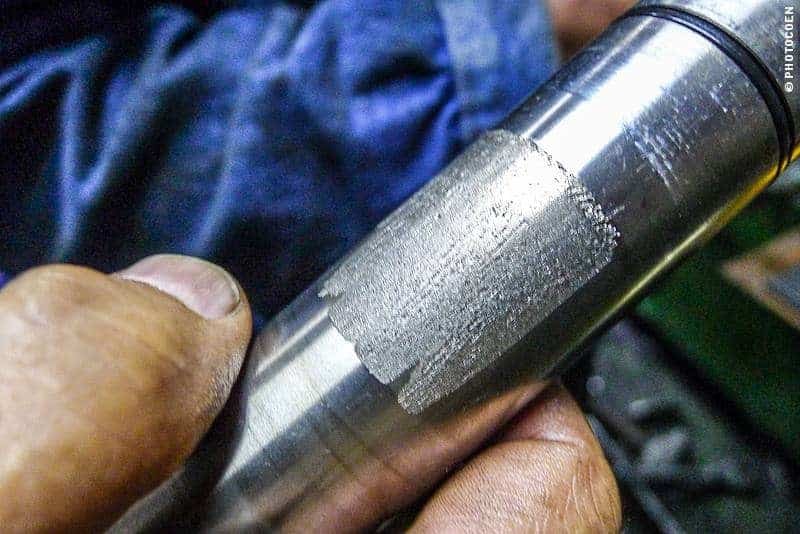 A big round shiny metal rod, which is called the idler shaft, had some wear markings on it, which is quite normal I later discovered, also needed to be replaced. It had to be seen whether we would be able to locally source one. 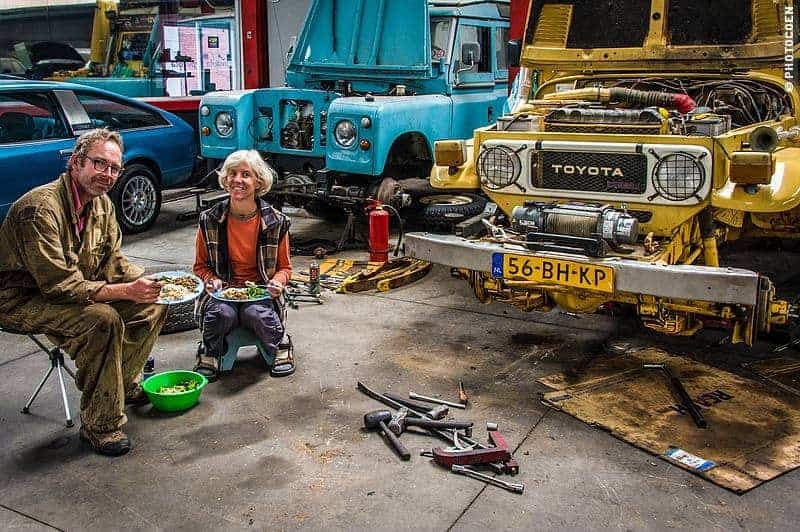 During one of Pedro’s investigations of our Land Cruiser, he stumbled upon the fuel injector lines and concluded they were too rusted to his liking. He suggested to have them acid-cleaned as well. 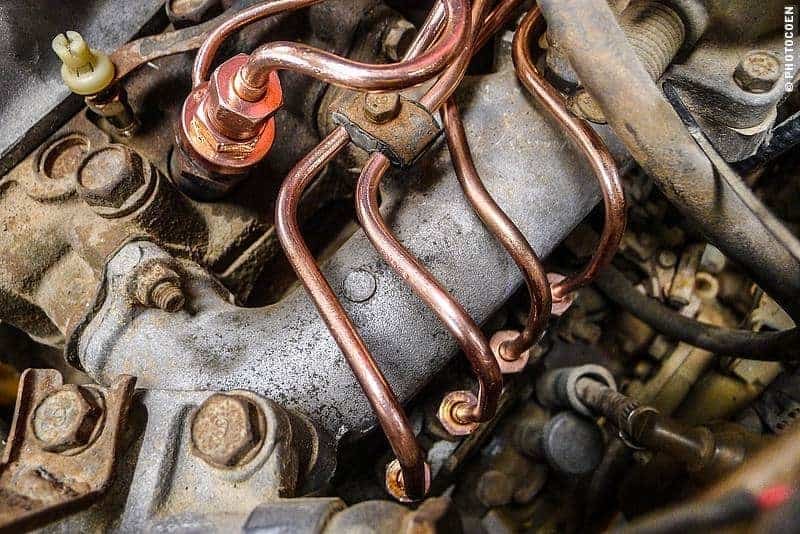 So, on one of my numerous visits with mechanic amigos to the Chromadora, to have a look at how the rims were progressing, I took the fuel injector lines with me and negotiated a fine price of $5 to have them acid-dipped and copper-plated. This would take considerably less time than the rims, as they are tiny and delicate. 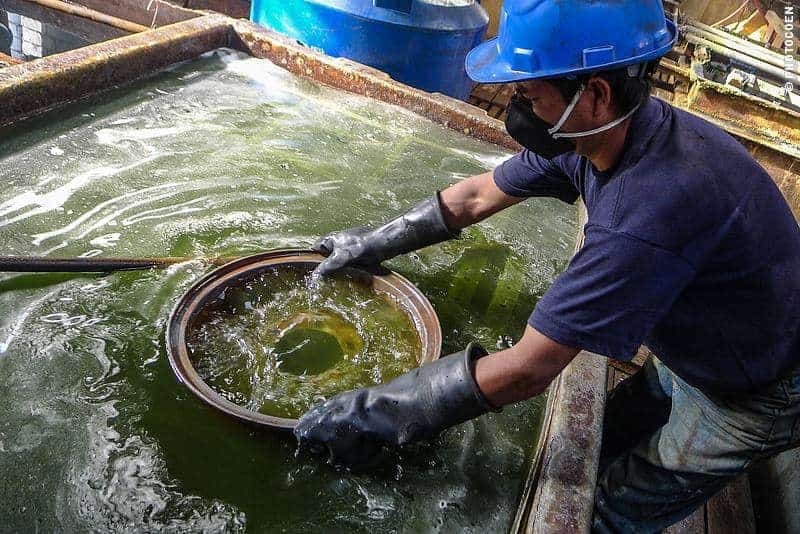 Some of the rims, on the other hand, are spectacularly oxidized and as a result the whole acid-dipping process would take well over a week in order to clean out the tiniest specks of rust inside the crevasses. Subsequently they would be galvanized and powder coated. One Saturday morning, mechanic Washington arrived a few hours late because it was his birthday. He cleaned the chassis, welded the crack and put a reinforcement over it. 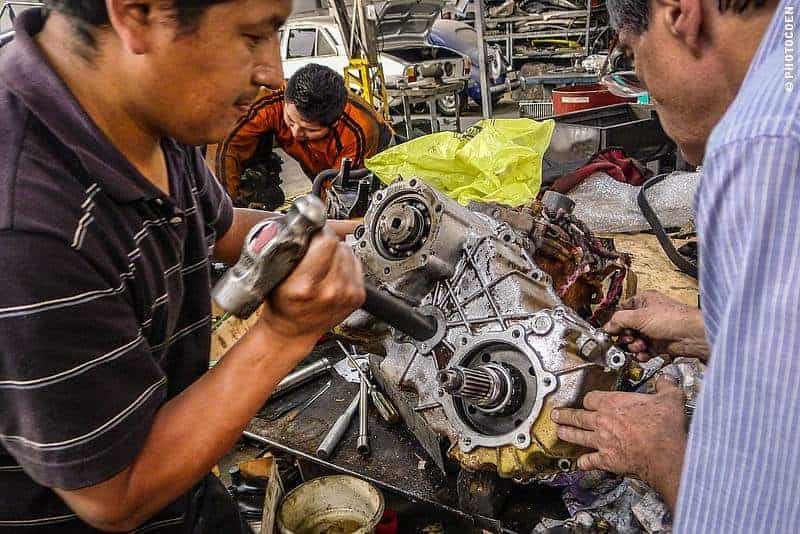 The whole process took no more than an hour and we took the rest of the day to visit La Mitad del Mundo and other sites with the Santiagos – a father and son working on the son’s future car in the workshop, who had suggested to do some sightseeing with us. We had a relaxed, pleasant day in their company, but the hype around the circus of the equator is lost on us. What we did find interesting was to learn that the French had a large partaking in measuring the equator. There is a small but informative museum about this among Mitad-del-Mundo’s Disney-like restaurants. In the museum are explanations on how one scientist came up with the system of measuring in meters, while in another corner it commemorates Dutch explorer Mercator for its detailed maps and globes. Monday arrived and Karin-Marijke instructed me to find out if whether could source the idler shaft in Ecuador, or needed to get it from abroad. Our parts catalog told me that all idler shafts of the 40 series are equal for the 4-and-5-speed transmission. A quick scan on the Internet told me it would cost for around a whopping 70 U$ in the States. Fortunately, a few phone calls later we felt confident that we wouldn’t have to fly in parts, although reality has taught us that only seeing is believing – we kept our fingers crossed. Talk goes fast in Quito. The press had already got a whiff of our presence and we had an interview scheduled for later this week. We were not moving this week, that much was for sure, and they could come any time to shoot some images and take a few notes. Fine with us. Meanwhile I spent a whole day with Arnanad [Pedro’s brother] chasing 5 new 7.50 x 16 tubes for the tires. I told you that I [actually the tire-doctor’s place in Macas] discovered why we had such a tough time in Peru with all those flat tires. 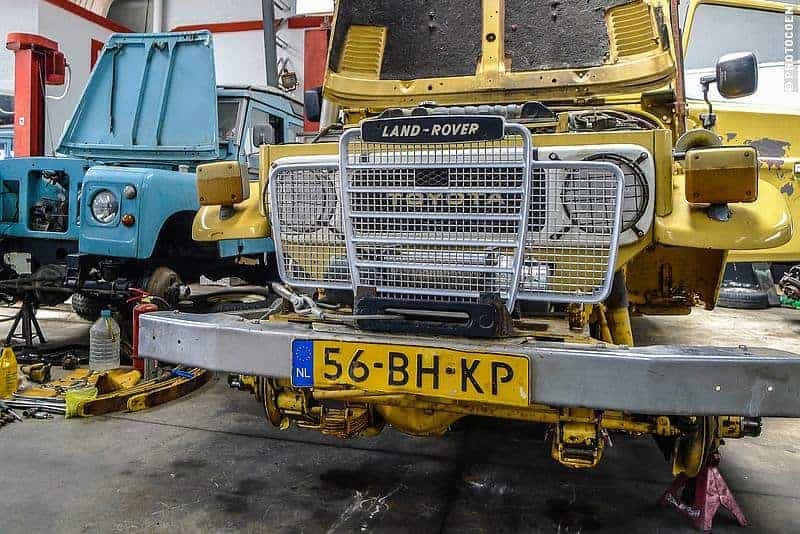 During the first nine years on the road, during which we had very few flat tires, the Land Cruiser always had 7.50 x 16 tires, either conventional cross-ply or radials with tubes due to the split rim system. The last time we needed new tires we couldn’t find any suitable 7.50R16 in Manaus [Brazil], so we resorted to a similar-sized 235x85R16 with a good-looking AT block design, which assisted us greatly through the BR319 [read about it here] and the Transamazônica [read about it here]. However, these same good-looking AT tires turn out to have become our enemies because their interiors have some sort of veins that rub on the tubes, especially when aired down, which we have done a lot during the last two years. I had never thought about this since we never had that problem before with the 7.50s, not even the radials. For the past couple of months I thought that the culprits were our 7-year-old Indian tubes that were still in the tires, so I had changed them for new ones in Lima. You can imagine my surprise [to put it mildly] when we had another flat on perfect asphalt in south Ecuador. When the tire-doctor in Macas showed me the worn tube and how it showed clear chafing marks that resembled the same pattern as the inside of our good-looking AT tire, I realized I got the problem finally nailed. “Do you have spare tubes?” The tire-doctor had asked me. “I think I have one in our top box.” I went to have a look. “However, that won’t help. The same will happen to the new tube,” I argued. “Don’t worry, we have experience with these kinds of things, you know,” he replied and went to look for scissors, leaving me puzzled. “Look,” he said as he cut up the old tube. “We will make an extra protective layer out of your old tube, and lay it on the new one.” And with that he inflated the whole shebang and put the tire back together. Now I was at the biggest tire dealer of Quito, but they had trouble sourcing me five of the same tubes. 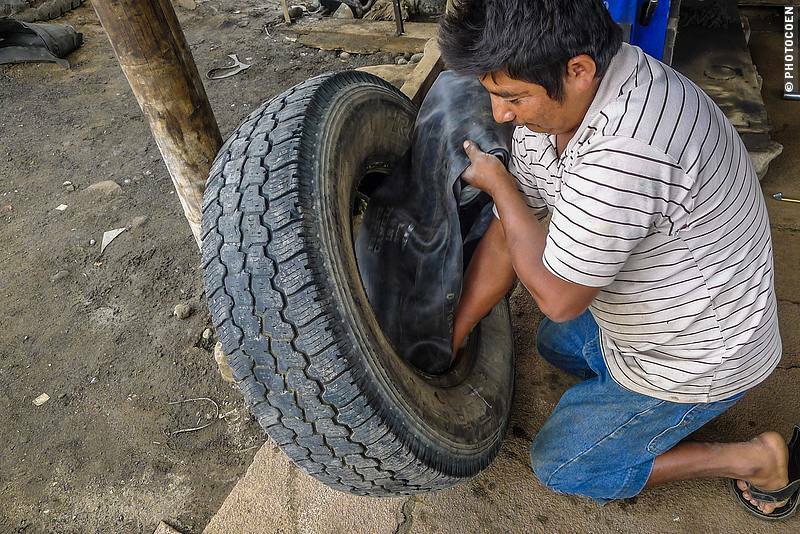 I guess 16″ isn’t a regular size for Ecuador with most of its cars being city slickers or pickups with 15″ rims. But in the end I got them and brought them over to the place where the tires were stashed. Back in the workshop we learned that one of the idler-shaft-horses we had bet on, was, in fact, a miniature version of the one we needed, and so we were one option away from flying in parts. This, by the way, would seriously threaten our visa stay as Ecuador allows us only 90 days per calendar year to stay in the country. Every single day extra would set us back 380 U$ in fines for the Land Cruiser; clearly, something we wanted to avoid at all costs. It was Wednesday and I found myself in a car with Gustavo, Pedro’s fixer. All day he is driving around dropping off stuff, buying parts and picking up stuff. We were on our way to pick up five new-made gaskets for the gearbox and, hopefully, a new idler shaft. Gustavo knows his way around Quito, and he drove on autopilot as he steered into a cul-de-sac and parked in front of a sign on a gated wall that looked vaguely familiar to me, but I was not sure how it fit the picture. It said: Terra System 4×4. Inside, I met Santiago Uribe and when he told me about the occasional foreign overlander visiting his shop it all became clear. He told me he used to have a shop in another part of the city, but that he had moved here a few years ago. So this was the shop I had looked for in the first place, see part one of this story. How the world moves in wonders! Santiago produced a black idler shaft that was identical to the one I carried but for the color. Mine was all shiny. “Don’t worry about the color, it is just a protective coating which will disappear as soon as it is put in action,” he said. He took out a pocketknife and started to scrape the coating on the short end of it to show me its shininess underneath.”Great, we just need to measure it, to be sure.” I replied. “Great, we just need to measure it, to be sure.” I replied. “No problem.” He rummaged in a drawer and produced a caliper. “You know you are very lucky to have found this part. Not many of these here anymore,” he commented while measuring both parts. 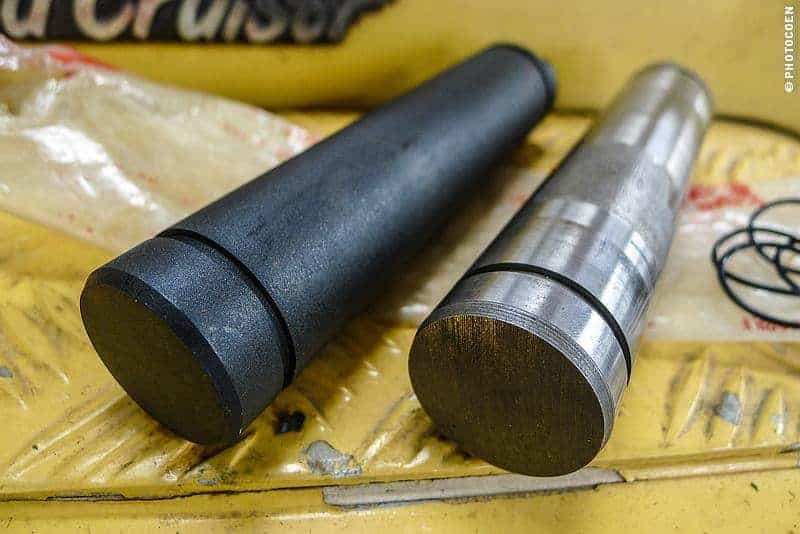 The idler shafts were identical in size and I happily paid the 58 U$. I stepped outside his office when I glanced to my left and noticed only old Land Cruisers. “Wow, are these all yours?” I asked, as I walked towards them. “What about this beauty?” I wanted to know, pointing out a light-blue colored 40. 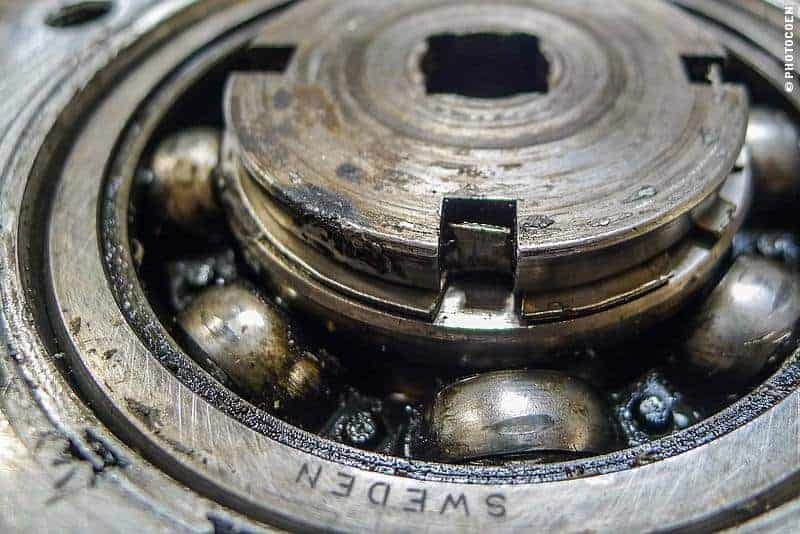 I couldn’t believe how fate had put me here, right in the spot where I found the piece I had been looking for in the first place some weeks earlier, as well as the idler shaft we badly needed. Plus, as a bonus, the workshop being full of nice-looking old Land Cruisers. My day couldn’t go wrong anymore. On the way back to Pedro’s workshop we picked up a couple of o-rings and the gaskets, so we were good to put the transfer case back on the gearbox. We also needed to address problems we found inside the transfer. Fixing a damaged thrust washer, fabricating a new locking shim that got damaged beyond use, and finding an o-ring to replace the burned o-ring [3 years ago in La Paz, Bolivia] on the overdrive rod. Remarkably we got all the pieces of the puzzle together and had the transfer case bolted to the gearbox in a jiffy. Time for the heavy work. 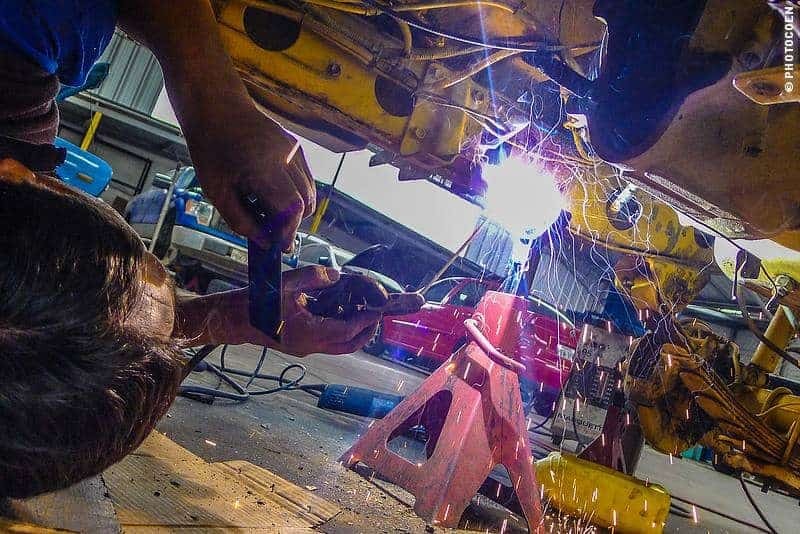 You may think that lowering a heavy-duty gearbox is difficult, but I tell me you I envy you guys driving around in vehicles of which you can lower of lift the gearbox all by yourself. Luckily I was in good hand with Pedro’s crew. The same arguing, cursing and cajoling went on under the Land Cruiser as I held the rope again, meanwhile holding the LedLenser [read about it here] so that the guys below could see where to put the shaft. When the bridge was positioned under the gearbox, Freddy informed me that I was on my own from now on since he was quitting the shop and left me to it to fixate the box and reattach all the levers and cover. Oil was in, now it was a question of waiting for the wheels. Story to be continued in Problem Solving on the Road part 3. Where is part 3? Very interesting articles .. I envy your travels. I have really enjoyed this mini-series of articles– as well as all of your adventures of course! Is part 3 completed yet? Thank you for reminding me… I really have to get that piece on paper. Working on it right now… Need more coffee! Thank you all for you patience and I’m sure you are glad to know that part 3 is now up and online! Let me know what you think.